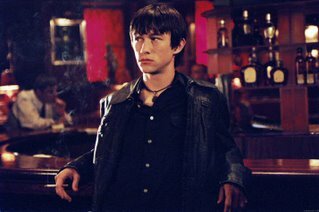 Another Grudge DVD - bring it on! 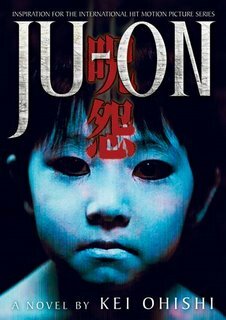 I've been reviewing the Japanese Ju-on and Grudge movies over the months and it's overkill to recap them all here for newcomers, so here's some links. 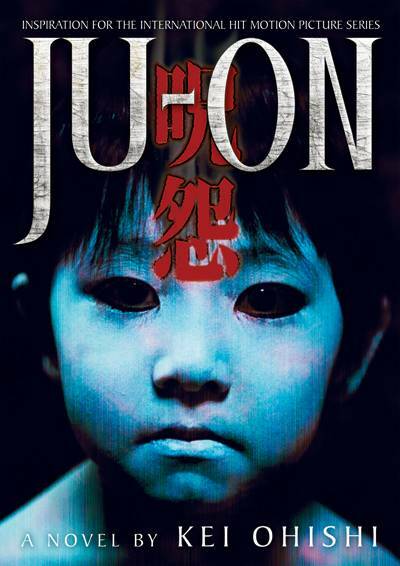 I've previously made out a list of the series and reviewed the first Ju-on films. There are also my reviews of the Japanese films called The Grudge and The Grudge 2 (number 3 is reportedly on the way). 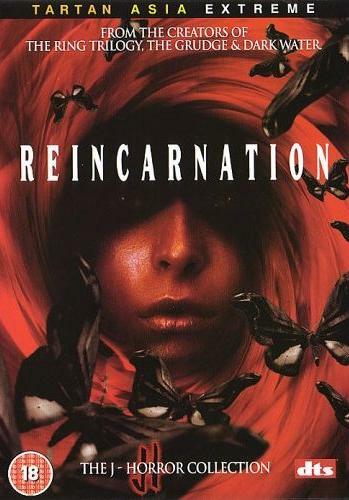 I was also very impressed by director Takashi Shimizu's Reincarnation recently. 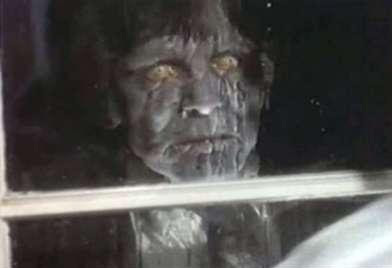 Timed with the cinema release of the American remake of The Grudge 2, comes the DVD release of the cut of the first US Grudge that I always wanted to see. The ‘Extended Director’s Cut’ of The Grudge was originally only released to Japanese cinema audiences. Only now do the rest of us get to see it. This DVD also has a completely new batch of extras. 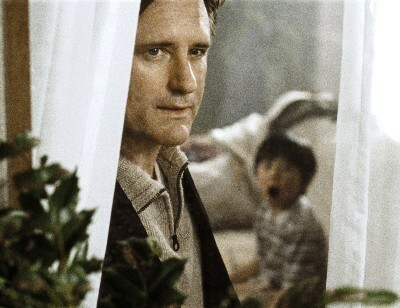 Bill Pullman is the third actor to play the teacher in this familiar scene from the series! 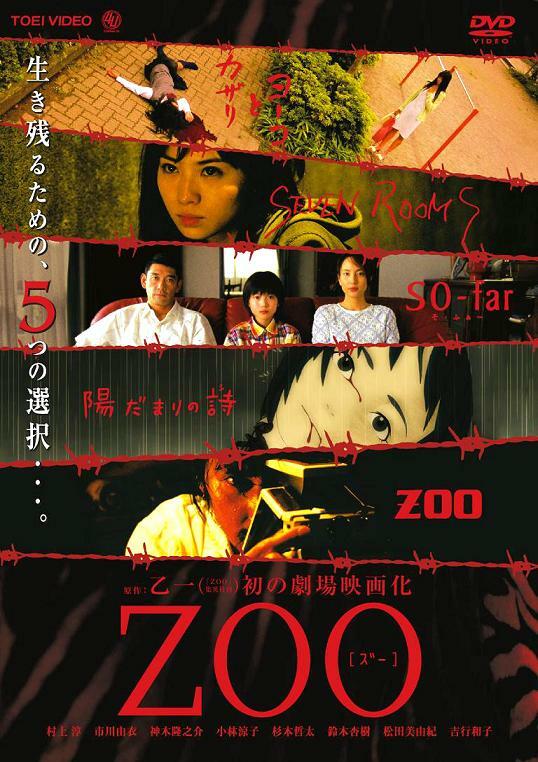 Sam Raimi’s production company bravely tried to do something different with this remake of a Japanese horror – instead of totally rewriting and recasting it, he hired the original Japanese director, some of the original cast and actually shot it in Japan. The main difference being to deliver an English language version with American stars. It helps that director Takashi Shimizu is an expert on US horror films, and reckoned he knew how to tweak his film towards a western audience. 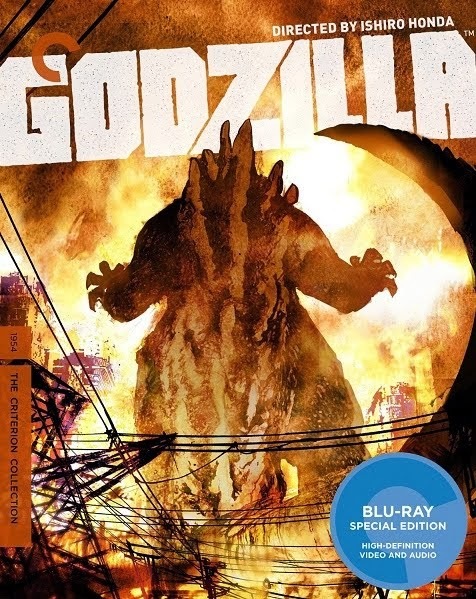 On first seeing the US version in the cinema, I was immediately disappointed with the muted versions of the scare scenes that I’d enjoyed in the original Japanese films. The Grudge seemed to be a round up of the best bits, but not as scary. I jumped a few times because of the pumped-up volume of the soundtrack, but I wasn’t creeped out at all. Where was the ghastly croaking sound? Crucially, new audiences to the story would have been pretty confused by the first scare scene with the huge computer-generated ‘hair swarm monster’, because it looks more like a monster than a ghost. 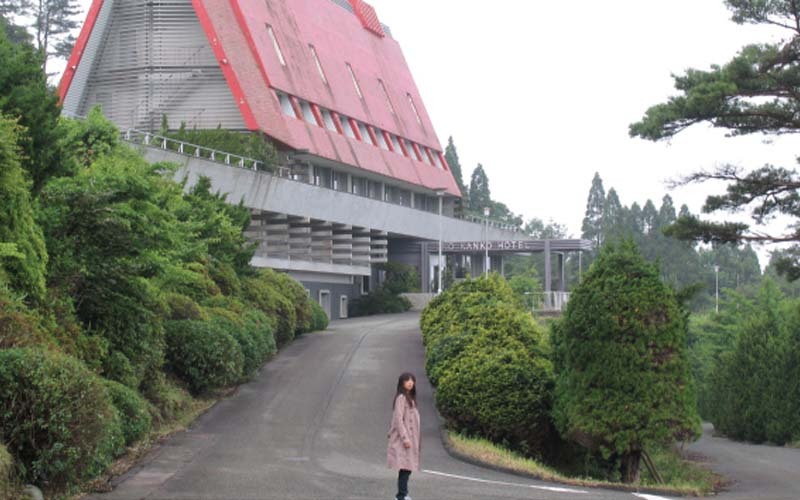 I was sad that Shimizu didn’t use the original house location any more ('the star' of the first four films), electing instead to rebuild a new slightly altered version entirely on a soundstage. The exterior shots of the house aren’t convincing enough. I was also bemused that a Japanese director would choose to portray Tokyo as noisy, unfriendly, unhelpful, and with such overcast weather. Not my experience of the city at all. The American cast were likeable and I enjoyed seeing the original Kayako and her husband being played by the same actors from all the previous Japanese versions. The Christopher Young soundtrack was suitably haunting. But it wasn’t a scary film, and didn’t add to The Grudge mythos, which had been growing with every film. - finally, as the ambulance leaves the house, we get a flashback to Kayako, husband, son and cat moving in on their first day in the house – it’s a welcome change to see them together as a family and see her smiling for once! So is the director aiming his scares at an American audience by using less explicit horror? Almost all the major scary set-pieces have been diluted. Was this to appease the censor, or to appeal to western audiences? If you haven’t got The Grudge already, I’d fully recommend getting the director’s cut – it doesn’t pull its punches, and it makes more sense! 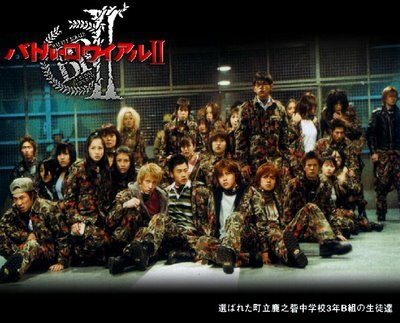 The DVD also has new extras, most importantly Shimizu’s two short films, 4444444444 and In A Corner, that first got him noticed – they also feature characters from The Grudge and can easily be considered part of the series – one is even back-referenced in the first ever Ju-on. Other extras include video diaries – Sarah Michelle Gellar good-naturedly complaining about her long shooting days, and KaDee Strickland’s engaging and enthusiastic tour of Tokyo. There are also over thirty minutes of deleted scenes! These look good enough to have been part of the film – presumably a two-hour running time was once a possibility. In other Grudge news, there is now a novel based on Shimizu's original stories. Written by Kei Ohishi, it's just been released in a translated paperback version. Six years before The Naked Gun movies made Leslie Nielsen a film star (again), the creators had already used the characters of Frank Drebin, Ed Hocken and Norberg, as well as most of the gags, in a short-lived but much loved TV series. Police Squad! 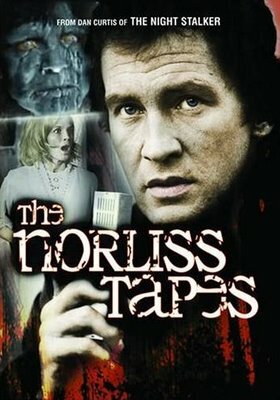 has finally been released on DVD in the US and UK. Like the sixties TV series of Batman, the actors have to play ridiculous characters with straight faces, while sending up the genre of police detective shows. I'm sure episode director Joe Dante (Gremlins) added some in-jokes and movie references of his own. 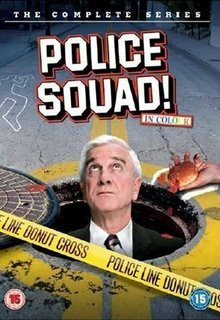 If you've seen The Naked Gun or Airplane films, you'll know what humour to expect, but Police Squad! also spoofs various TV conventions of the seventies, particularly those produced by Quinn Martin. 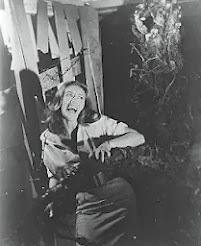 Shows like The Invaders and The FBI insisted on titling every single section as an Act, alluding to scenes from a Shakespearean play, including the Epilogue. QM Productions also had voiceovers read out the opening titles to the viewers, the names of the episode and the guest stars. Very useful for the under-5s. All six episodes of Police Squad! are on this release, together with a recent interview with Nielsen, who explains that while the cast and crew thought they were working on a sure-fire hit, the ratings reflected that TV audiences weren't interested in paying enough attention to the action to get the gags. Without a laugh track (again like Batman), viewers weren't cued into the deadpan humour and the series was dropped. 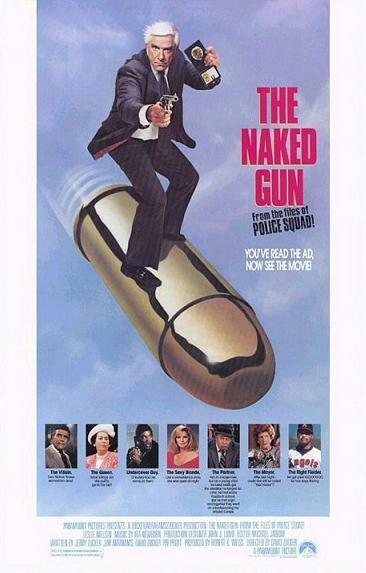 Luckily, the producers knew the characters were worth another shot, and The Naked Gun movies revived the format, but with Drebin's boss and assistant recast with the better known George Kennedy and O.J. Simpson. Kennedy is just as good at deadpan as Alan North, but O.J. 's slapstick Nordberg is no substitute for Peter Lupus's enjoyably dim Norberg from the TV series. 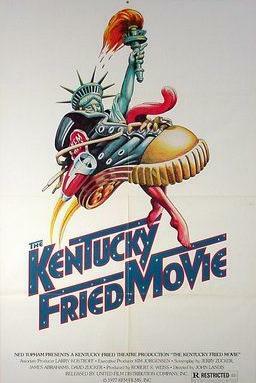 Movie send-up kings Jim Abrahams and brothers David and Jerry Zucker, first worked on a movie together with Kentucky Fried Movie (1977) a must-see collection of sketches which they co-wrote and appeared in. The film launched director John Landis into his big hits, National Lampoon's Animal House (1978) and then The Blues Brothers (1980). Abrahams and the Zucker brothers took on the directing of their next film Airplane! (1980), spoofing Airport disaster movies around the framework of an old Arthur Hailey thriller Zero Hour (1957) (a review in which I talk about their later careers and more about how Airplane was dreamt up). 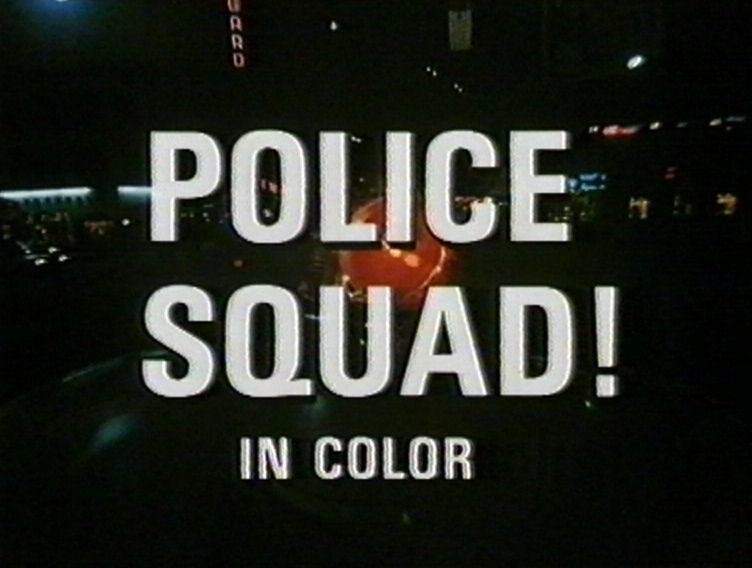 Police Squad! is the link between Airplane! and The Naked Gun, continuing the brand of humour and especially Leslie Nielsen's priceless character, spoofing his seventies TV and fifties film star personas. I've enjoyed watching these essential TV episodes again, now remastered with a clear audio track and crisp film transfers, so you can't miss a single gag, if you're paying attention, that is. I've been watching Hammer films for over 30 years, usually on TV, and have tried to watch all of their horror output. 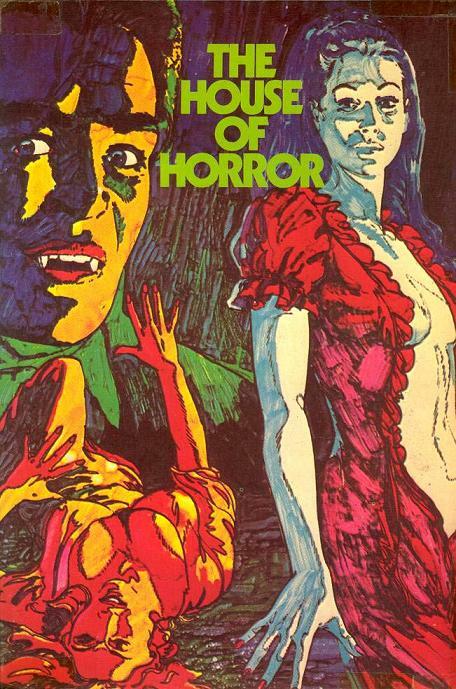 Initially lead by the photos and posters from a book I bought in the seventies, The House of Horror, the titles all looked interesting and they seemed to be fairly consistent in delivering the goods. 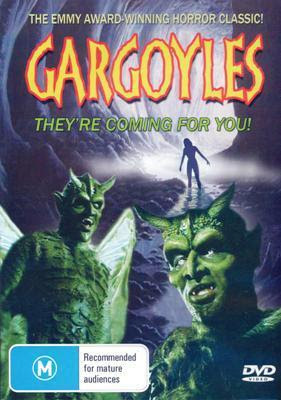 Today, I still haven't seen them all, and have only recently seen Night Creatures and Straight on Till Morning because of their scarcity on home video. 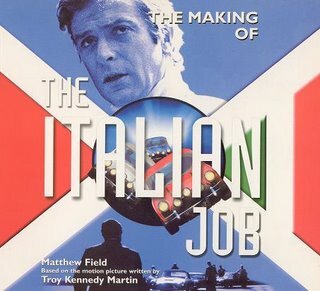 I bought this DVD a few months ago, and was reminded to watch it while reading The Making of the Italian Job. The director of that classic British car chase/heist/comedy was Peter Collinson. Looking at his filmography, I hadn't realised until now, that he was often a horror movie director. Collinson directed And Then There Were None (1974 - the Harry Alan Towers version of the Agatha Christie tale, with an unusual cast), The Spiral Staircase (1975 - another remake) and Fright (1971 - a gritty, claustrophobic babysitter-in-peril story with Susan George from Straw Dogs as the lead). His Straight On Till Morning was billed as a Hammer Love Story in the publicity, the implication is of a romantic drama with a dark side. That’s putting it lightly. Brenda, a young woman with romantic notions of finding the perfect man to marry, leaves Mum alone in the family home in the north of England and moves to London, which is still swinging, despite the end of the sixties. A solid cast and interesting direction make this an enjoyable watch, especially with the eclectic fashions and furniture on display. Rita Tushingham, obviously cast as Brenda because of her famous role as an outcast single mother in one of the earliest ‘kitchen sink dramas’ A Taste of Honey (1961), is a charming lead as the ‘ugly duckling’. She was like a sixties Molly Ringwald – playing engaging leading roles, without having movie-star looks. The actress is still working in TV drama. Her psychotic love interest, Peter, is played by Shane Briant. 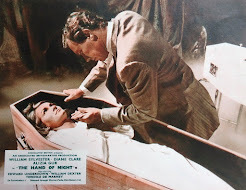 He was then being groomed by Hammer as a younger version of Peter Cushing, possibly to even become Frankenstein's successor (he later played the good Doctor’s assistant in Frankenstein and the Monster From Hell). He could also appear in younger groovier roles like this. Like Cushing, Briant also looked good in period costume, like in Captain Kronos - Vampire Hunter. In the seventies, his Austin Powers hairstyle suited him and, not surprisingly, he was cast as the lead in Dan Curtis' TV adaption of The Picture of Dorian Gray. He still works internationally in TV dramas, guesting recently on Farscape. There are also small parts for Likely Lads James Bolam, and the villainous Tom Bell who’s almost entirely covered in hair and sideburns – a change from his usual neatly-groomed tough detective roles. But it’s the editing that’s the star of the show for me. Obviously influenced by the almost revolutionary Performance (eventually released in 1970), from directors Nicolas Roeg and Donald Cammell. Using inter-cutting between scenes, flash frames, flashbacks (without sound) and disorientating close-ups, all makes for an absorbing and current method of actively involving some concentration from the audience, with several scenes unfolding at once. No surprise then that editor Alan Pattillo had just worked with Roeg on Walkabout (1971). As the cross-cutting calms down, so does the story, as the characters converge. But the tension continues, because we still haven't seen inside Peter's room in the attic, where women enter, but are never seen again. 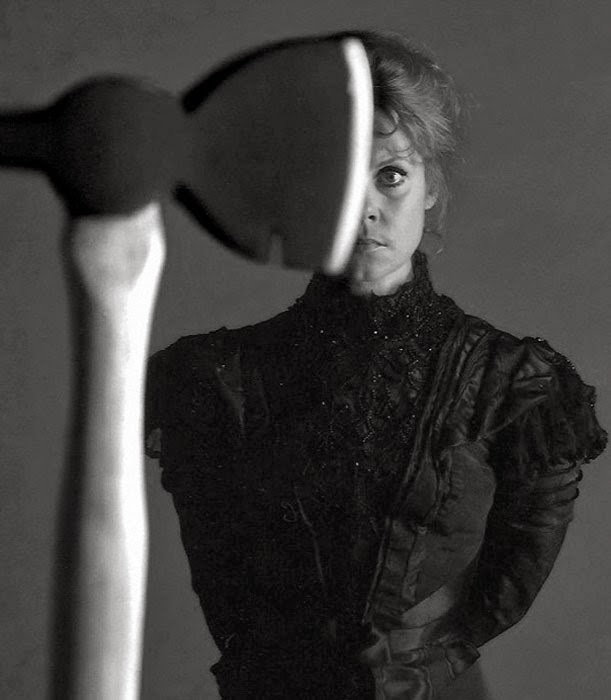 The film relies on the sound of murder to be terrifying, with short ‘flash’ visual cuts to give the impression of violence, still leaving much to the imagination. Like the Psycho shower scene and the trowel murder in Night of the Living Dead (1968), it's mostly implied with editing, but still strong stuff. The King’s Road, West London setting related to the trendy in-crowd of the ‘Chelsea set’. Another shooting location is the concrete clad South Bank Centre, which at the time looked remarkably clean - it still houses the National Film Theatre, one of the only major retrospective cinemas in the country. The story is suspenseful right up to the end, but is let down by a sudden, unsatisfactory ending, which leaves some major plotlines unresolved. But it was good while it lasted. This is available in the US and has just been released in the UK as part of The Ultimate Hammer Collection Box Set, a mixed selection of titles in an unwieldy 21 DVD batch. 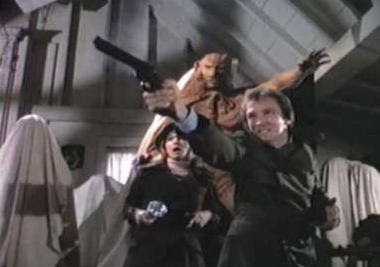 Here's another DVD review on DVD Maniacs with full plot spoilers and screengrabs. I’ve spent the last couple of weeks revisiting Lain. There are many reviews and descriptions of the series out there. Anime News Network has a good one. I’d just like to add my thoughts on one of my favourite anime series. Watching the series induces a sort of hypnotic effect, that I’m very in tune with. It certainly captures the immersive effect of spending a long time on the net. 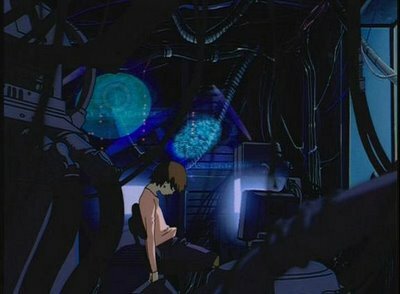 The story looks forward to people being actually recreated online, and able to exist without their physical beings. Only last month, I saw a BBC Horizon documentary about scientists and theorists already trying to make that work! Lain is one of the first anime series I got into. I was surprised at how adult and cerebral anime could get. 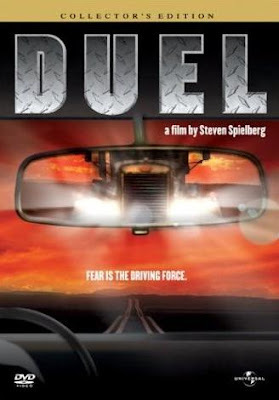 There’s very little action, but it’s rich with ideas and atmosphere, and the plot is hard to follow – it makes you think. I get the drift, but I’ll probably never fully understand everything that’s going on. Which again makes it intriguing and rewatchable. As it stands, this series will remain ahead of it's time for a while yet! Of course, the producers were trying hard for this to be a different kind of anime – but just the fact that they were able to complete the series (and not get cancelled halfway, for instance) impressed me with the genre. That there was a medium out there that could allow experimental and intelligent products. The look of the animation also impressed me. It had impact without using much motion, a technique perfected in anime, usually constrained by budgets. But the effort and technique that go into the fairly static shots is impressive. 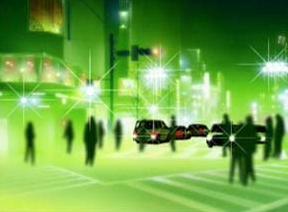 For example, in the opening of every episode – there’s a shot of out of focus traffic – car lights are recognisable as blobs of color, and abstract lens flares. Easier to film than to draw. Beautiful and interesting to watch. The sound design is also extremely well done – like the indistinct murmur of traffic and crowds in the opening shots, or the ominous sound of power in the overhead wires. I hope that an even more immersive audio mix will be made in 5.1 surround, perhaps for a future video release. The series spawned three official soundtrack CDs, confusingly one of them is called Bootleg. There are still new books and merchandise being produced. There was even a video game. 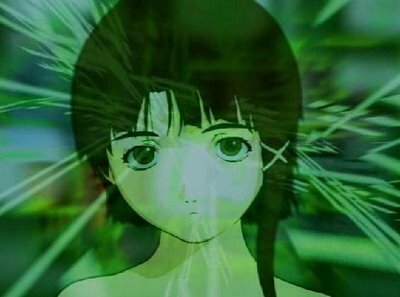 Like Lain’s worshippers in the series, I’m almost hypnotised by watching the series. In the future, I know I’ll have to return and gaze at her again. 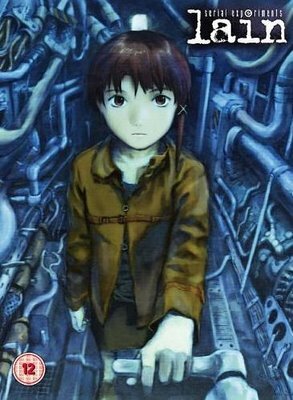 There's an in-depth site on the ideas in the series, called thought experiments Lain. South Korea's huge summer hit is in UK cinemas from today, including 17 screens in London. It's had very good reviews and I was bowled over by it - it's my film of the year! But, as usual with Asian releases, I haven't seen much publicity for it around town, and the UK poster art (not pictured) is pretty poor. So please don't miss this rare chance to see some great Korean cinema, er, in a cinema. 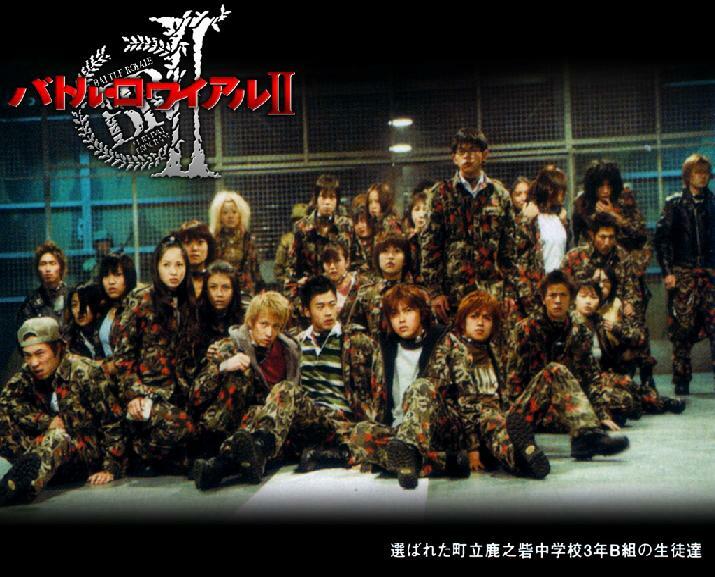 What is it about Takashi Shimizu’s films that frighten me so much? I’m glad they do – there’s so little else that does. Watching Reincarnation, I was already creeped out before the opening titles had run. Again using his uncanny sense of location, that heavily influences the story, Shimizu has used a rundown hotel, and rebuilt it as a studio set as it must have looked thirty years ago. Cleverly, this is also what the director in the story does, an example of how Reincarnation works on several levels, much as Michael Powell’s Peeping Tom (1960) did. We’re seeing events as seen by the actual director, the character of the director, and through the eyes of the killer, who was filming his victims on the day. 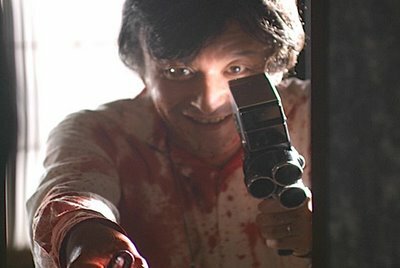 Shimizu manages to successfully combine key elements from many of his favourite classic horror films, such as The Shining, Psycho and even Dawn of the Dead (hurrah!). But it’s still an impressively original scenario in many ways. The nature of the haunting is interesting and the appearance of ghosts as a group is effectively done. The narrative shifting between time-frames and between hotel and studio set is effectively done. Shimizu reuses his device of disconnected strangers slowly linking up, and also uses familiar methods from Ju-on to show ghosts appearing, but he builds on his old methods to portray a harrowing descent into a time and place we’d rather not be… smack bang in the middle of a spree-killing in progress. I was reminded of the atmosphere of dread that director Gus Van Sant elicited in Elephant - a powerful evocation of the day of the Columbine High School shootings. There are many startling scenes, brilliantly staged and filmed. 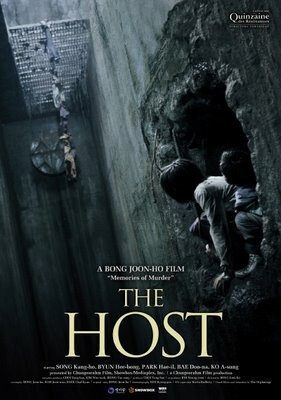 A clever and ghastly nightmare – this is easily the best of the J-Horror Theater films, and at the moment I’ll say it’s the best Takashi Shimizu film yet. 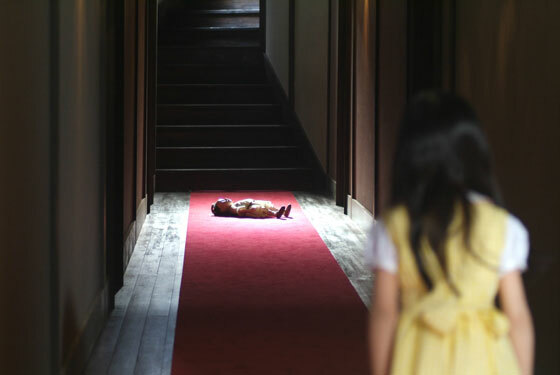 I’m saying that speaking as a big fan of The Grudge/Ju-on movies too. Once again, the UK DVD art is unimpressive (at top). With cover art this vague, the film won’t sell on the title alone, given the weak and unscary films that have dealt with reincarnation in the past. The creepy covers and posters used in South East Asia may have shifted a few extra copies. The Tartan DVD release in the UK has no extras except a couple of trailers. But the 5.1 and DTS audio tracks are very welcome, and the picture quality is super. 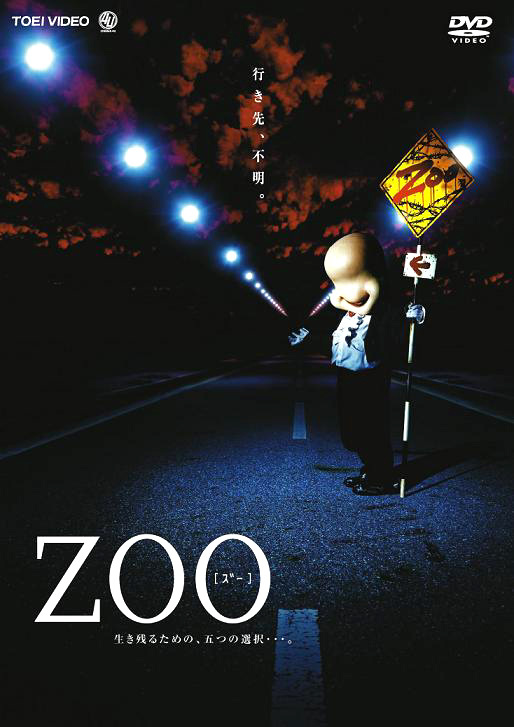 Zoo consists of 5 short films, all based on stories by author Otsuichi. Each story has a different cast, a different director and even a different scriptwriter. The result is unsurprisingly uneven. There’s no linking material, just a creepy, creeping red title graphic. 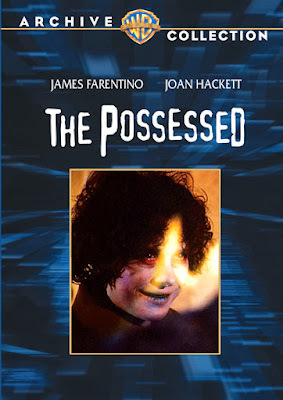 The cheeky, eyeless character in the evocative poster and DVD art unfortunately doesn’t appear in the film. I was expecting that little figure to be a linking device. I guess though that the stories are loosely linked by the themes of death and cruelty. The film opens with a horrifyingly realistic image of a girl falling backwards from a block of flats. She has not jumped forwards, she’s been pushed back. We’re not sure whether it’s a flash-forward or a dream. 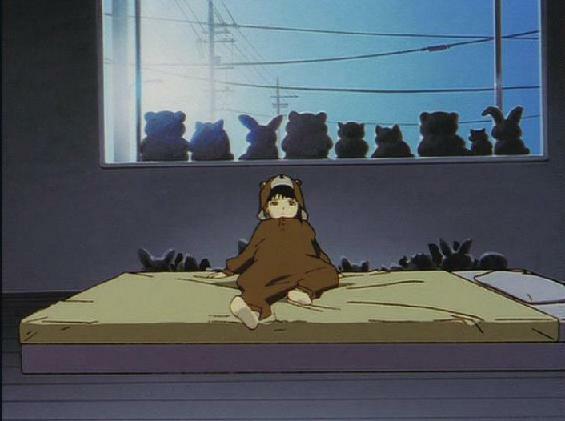 Ryoko Kobayashi (also from Hinokio) has a difficult dual role as two teenage sisters – one treated like a princess by their mother, one kept in a cupboard and forced to live like a dog, being beaten whenever she slightly annoys her mum. Strangely, Yoko’s abuse seems to go unnoticed and ignored by the outside world. Surely, if she was taken to the school nurse, her many bruises would be seen. Also, her sister’s reactions to the violence, physical and otherwise, are vague – it’s implied that Katari is complicit and complacent. There’s many aspects of the story that are frustrating. But then there wouldn’t be a story. This first segment is still interesting as a horror tale, but it’s the performances that are the weakest here. Such meaty characters have been, as usual, given to a young pop star rather than a trained actor. This is more intriguing. 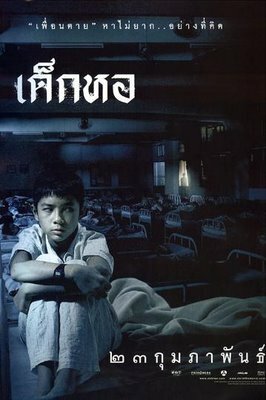 Mirroring situations familiar from Saw and Hostel (but without the gore), a young woman and her little brother, Satoshi, wake up in a stone cell. There’s a plate of food by the door and a concrete gutter of running water for a toilet. The little boy finds he can push along the gutter to six other cells. Talking to the other prisoners, they discover that one disappears each day, then there’s a new arrival the next. This should have been more frightening than it was – how many directors could foul up the arrival of a dark figure with a chainsaw in an enclosed space? Again the performances and the direction could have been a lot stronger here, but the story reaches a very satisfying conclusion. Like the claustrophobic Haze, I wished this could have been longer! Thankfully this story has stronger performances. But this time the story is weaker. 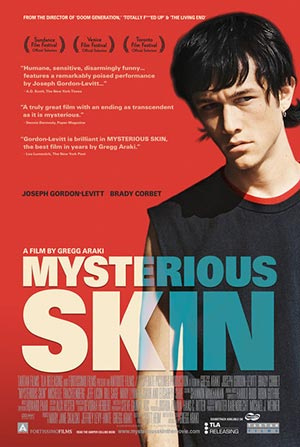 A young boy (Great Yokai War’s Ryunosuke Kamiki) is left alone in family the apartment one evening, he hears about a fatal car crash on the radio. When he wakes up, his parents are back in the flat, but cannot see each other. Only he can see both of them. Because story telling can be subtle in Japan, it’s not unusual not to see the crucial incident – we hear the crash, it’s more tragic and less sensational that way. It’s also cheaper to film - but I didn’t think of it as a cheat. In western films, if we didn’t see the crash we’d immediately know it was a story point. In Japan, it could just be the way the story is told. Anyway, is the boy seeing dead people? We don’t know if just one of them is dead, or what. This short scenario doesn’t really develop until the pay-off. Beautifully animated and directed, it’s not just the twist that’s enjoyable here. Lastly. Another nasty tale, of a photographer’s obsession with taking polaroids of his girlfriend, even after she’s dead! A pivotal scene takes place at a Zoo, but I wasn’t so impressed with the story. But each to their own – with five different directors, casts and stories – this is a grab bag where each tale could appeal differently. 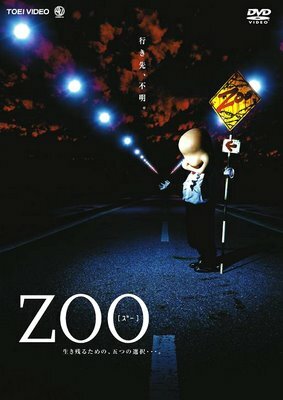 They’re certainly unpredictable and miles better than many of the Japanese scary tales of terror and horror that have actually been released in the States. I'll certainly be revisiting this in the future. 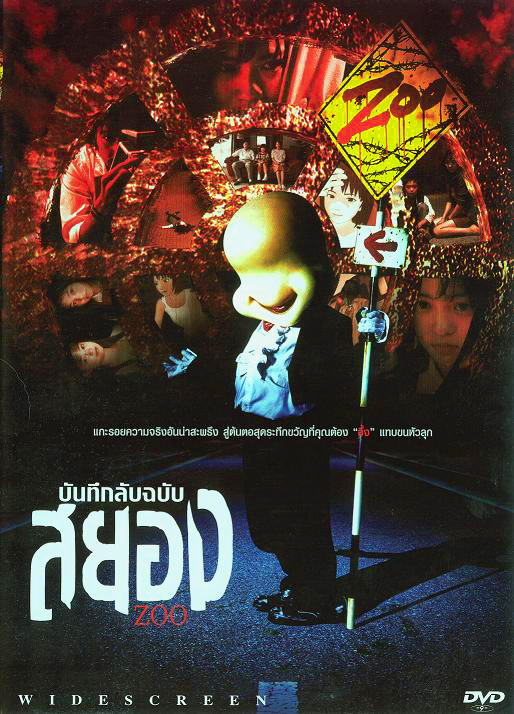 Zoo has crept out on Thai DVD with unpublicised english subtitles. Initially heralded by TwitchFilm over a year ago - it’s yet another Japanese title that’s in limbo, much like the cover art depicts. eThaiCD provided my copy – their website is innaccurate in saying there’s no english subs. They’re correct in saying it’s got Japanese 5.1 audio and an anamorphic widescreen aspect. 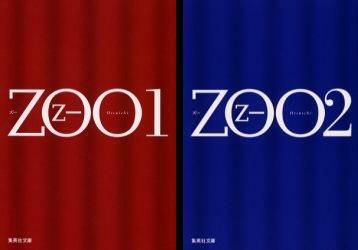 UPDATE 12th November 2006: SciFiJapan reports Zoo to get a US DVD release early 2007. Wow, 1959, and the little bits of blood and violence in the early Hammer films must have made quite an impression in Japan. 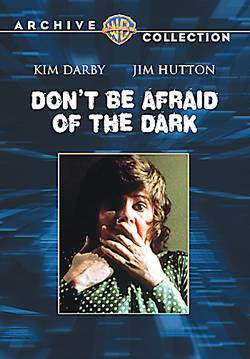 All the more shocking for being vividly shown in colour, this old traditional ghost story uses Hammer tactics to breathe new life into to an oft-repeated tale (according to IMDB it's been filmed at least seven times). A scheming samurai and a low-life apprentice double-cross their partners. The samurai dumps his wife to marry into money. Dumps as in 'kills horribly slowly'. No sooner does he marry again, then the haunting begins. His ex-wife exacts a long and terrible revenge from beyond the grave. This is certainly more explicitly violent than the fifties Hammers, I'd thought this was made mid-sixties, while watching it. The samurai fights are shown in long-shot, but we see wounds in lingering close-ups. Gorier still is the disfigured ghost Yotsuya, whose face starts to peel off as she dies, a wound that stays with her spirit even after death. Again and again she appears to the samurai, from every conceivable hiding place, repeatedly sabotaging his life in revenge. The story is in fact quite thin - it develops slowly, despite plenty of action. 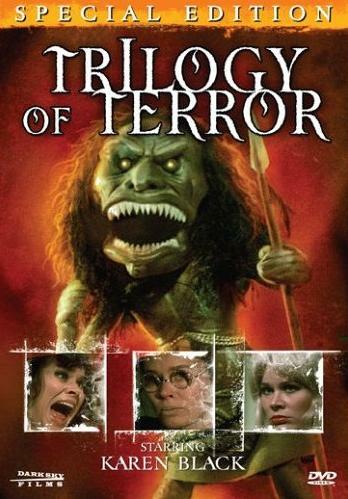 I suspect the film succeeded mainly as a series of shock moments, the story already being very familiar. This is a good-looking film, and a good introduction to this classic tale. Director Nobua Nakagawa's version would be hard to beat. After the slow, dastardly set-up over the first half-hour, it's then drama, chaos and death until the surprisingly sudden ending - the film is only 76 minutes long. Nakagawa seemed to specialise in ghost stories, and must have hit his stride with this one. His previous Lady Vampire was pretty poor, though I understand his budgets were very low. 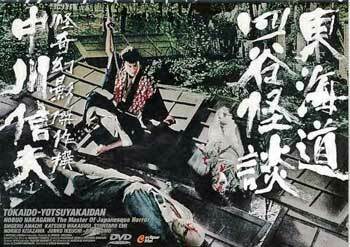 Yotsuya was low-budget too apparently, but like the Hammer films, certainly doesn't look it. The cinematography is lush, colourful and gloriously wide at 2.35. The camerawork is mobile and creative. The cast is fine, lead by Shigeru Amachi as the haunted samurai. He knows what he wants and stops at nothing, no matter how drastic, to get it. Amachi seemed to be the first choice for leading man by the director, working with him in Lady Vampire, Yotsuya and the highly-regarded vision of hell Jigoku (1960). 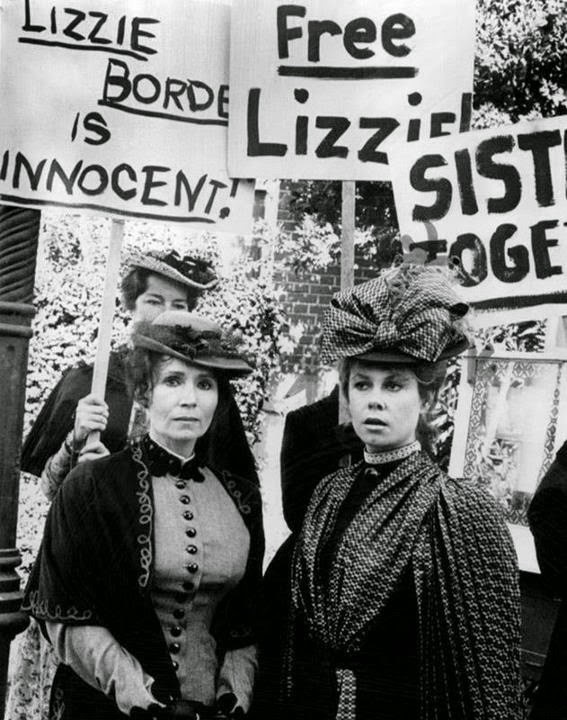 This is a period piece from nearly fifty years ago and doesn't really scare or shock any more. But if you want to see what a creepy Japanese equivalent of a Hammer film looks like, this is a very good example. No extras on this Eclipse series of DVDs, but the films are in very good condition, obviously carefully chosen and restored to represent the best of past Japanese cinema. Very good english subtitles. You can still easily get copies of this DVD from CD Japan. 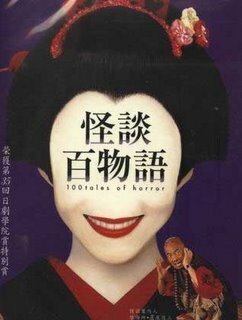 I've seen another version of Yotsuya, made for Fuji TV, as the first episode in a 2002 series called 100 Tales of Horror (Kaidan Hyaku Shosetsu). It was atmospheric but fairly tame, done more as a period drama. But I will still check out Kinji (Battle Royale) Fukasaku's version, called Crest of Betrayal (1994), and the more famous Illusion of Blood from Shiro Toyoda, made only a few years later in 1965. Gotterdammerung has the complete plot, a glowing review and lots of screengrabs... Spoilers ahoy! Weird Wild Realm has a great well-illustrated guide to many other versions of Yotsuya's ghost story.